Eating healthy is a constant theme in any household and ours is no exception. However, eating rice has never been a problem. We eat tons of rice! We eat it three times a day whenever we could! When I received the samples for Uncle Ben’s Whole Grain White Rice though, I was hesitant how my family would react to it. For one, they are a bit of a snob when it comes to rice. They consider Uncle Ben’s as the fast food of rice and they had always turned up their noses whenever I’ve suggested Uncle Ben’s in the past. So this time around, I didn’t tell them it is rice from a box. I just made it and threw the box away. Guess what? They ate it! The bad thing was, I forgot to take a photo! I made Uncle Ben’s Whole Grain White Rice with grilled steaks and steamed broccoli and we were so hungry that I forgot to take photos before everyone started tearing up their plates. Plus, I was a bit distracted trying to see their reaction to the rice. I was waiting for a negative comment, but none came! All I heard was, “These steaks are good!” yumm, yumm, chomp, chomp, chomp. Oh well, so here’s take two of the Whole Grain White Rice challenge. Surprisingly, this rice also lends itself well to frying. 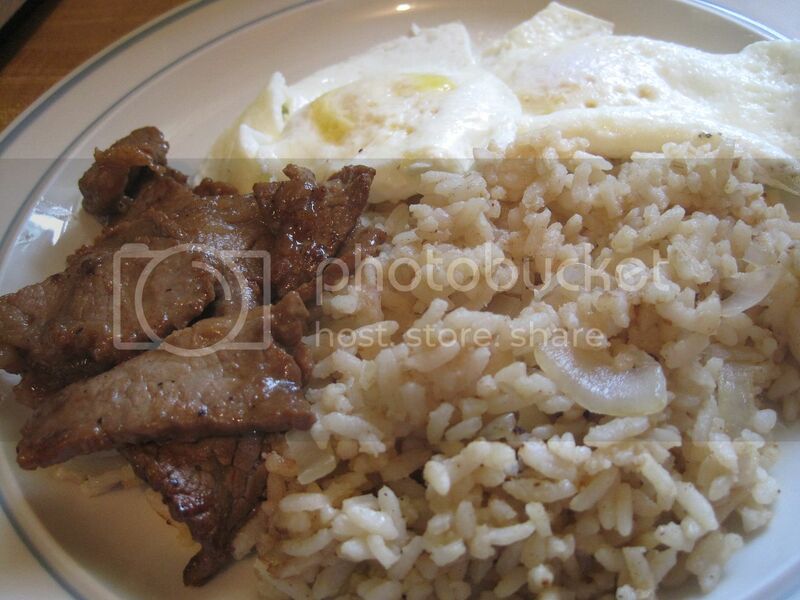 Last Saturday, I made a typical Filipino breakfast, TapSiLog [Tapa (marinated beef), Sinangag (garlic fried rice) and itLog (eggs)]. Round 2 of serving my rice snobs rice from a box, and still no reaction! They just went ahead and gobbled these up too! Finally, I can’t stand it anymore and I asked, “haven’t you guys noticed anything different with the rice?” One said, you put soy sauce on it? Duh! Well finally my youngest one said, “You started adding brown rice to our regular rice! You have been talking about doing it mom, I just figured you started”. Well, she was right in that respect. I have been talking about us eating too much white rice and that we should incorporate some brown rice into our diet. Actually, my doctor had told me to go totally brown because of my pre-diabetic state, but I just haven’t been able to get used to plain brown rice. So my daughter got me thinking, this Uncle Ben’s Whole Grain White Rice may not be a bad idea to transition into the fully brown rice! Want to try out this new rice? Leave me a comment below and let me know what you think about Uncle Ben’s Instant Rice or if you’ve tried it before. I will pick a random winner this weekend, June 6 and send you some Uncle Ben’s Whole Grain White Rice and an apron. They gave me extra sets to give away 🙂 Aren’t you lucky! THIS GIVEAWAY IS NOW OVER AND COMMENTING IS CLOSED – THANK YOU! This rice sounds healthy and tasty – a winning combination at my house. I’d love to try their new chicken whole white rice.